Tsukiji is a legendary district of Tokyo. It has always been one of the main attractions of any tourist city guide, thanks to its huge fish market and the famous tuna auctions in the early hours of the morning. At the end of 2018 the market was permanently moved to another area, therefore the neighborhood has been left behind by its main attraction and is looking for a new identity. The old and fabulous Tsukiji market (Tsukiji shijo, 築地市場), for decades recognized as "the largest fish market in the world", was officially inaugurated on October 11, 1935 and remained in business for 83 years, until October 6th, 2018. The market included several areas but the one that used to attract tourists was the giant wholesale fish market. On October 11th, 2018 a new and modern fish market was inaugurated about 3 km away, on the artificial island of Toyosu. The wholesale market is therefore permanently closed, but the narrow streets next to it continue to house, as before, a number of shops and restaurants that all together form a sort of secondary "retail" market for fish and other foodstuffs (sometimes called "outer market"). Since many years ago the growing number of tourists walking around the wholesale fish market had been causing a lot of problems to all those people who were there just to work. As early as 2010, entry had been forbidden to non-professionals until 11am and tuna auctions limited to 120 visitors a day. 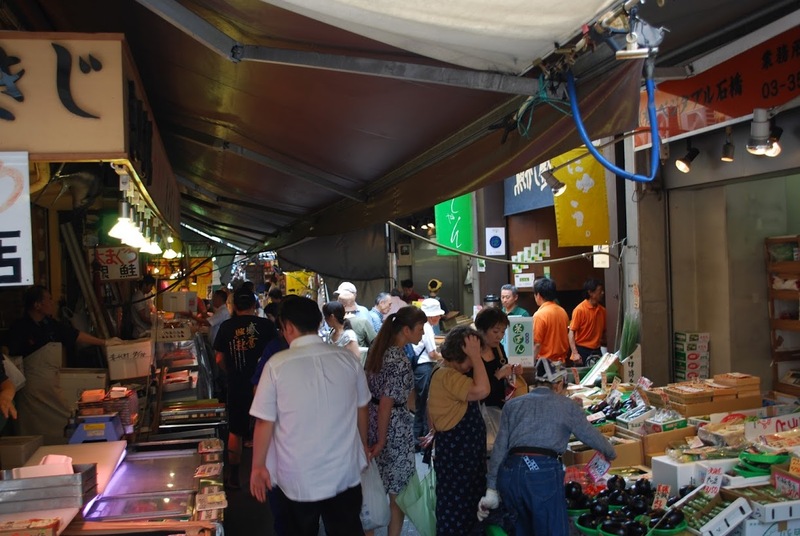 Then, the outer market (築地場外市場, Tsukiji Jōgai Shijō), open to all, has become more and more popular among tourists. These little shops and restaurants are still open and most of their fresh fish and vegetables is delivered directly from the Toyosu Market as it used to be when the wholesale market was in Tsukiji. 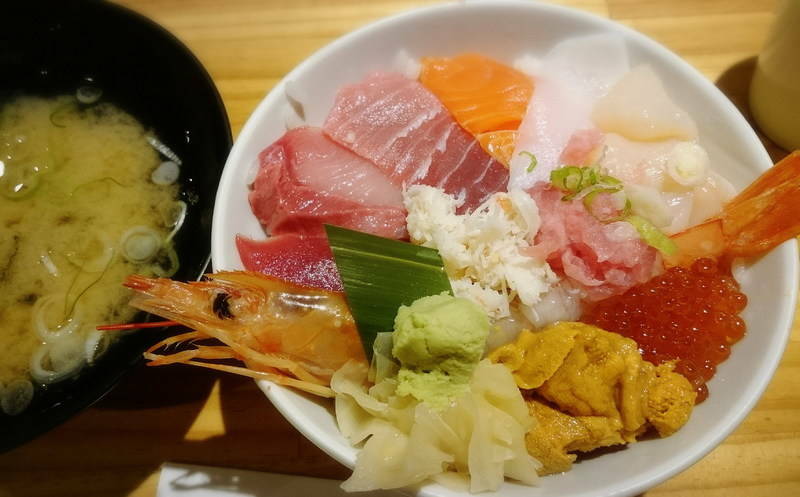 Therefore this place is still today a great place to eat the typical Japanese seafood dishes and to try to enjoy the magical atmosphere of the old market that you will hardly experience in the ultramodern Toyosu market. A very small Shinto shrine whose name means "protection from the waves". The foundation of this shrine is much older than the market, but after the opening of the latter the shrine became a sort of guardian for the market and all those who worked there. A Buddhist temple of the Jodo Shinshu sect built in 1937. The architect was Itō Chūta, the most famous architect of "Imperial Japan" of the early twentieth century. The temple has become renowned thanks above all to its particular external architectural style, which makes it unique in the city. 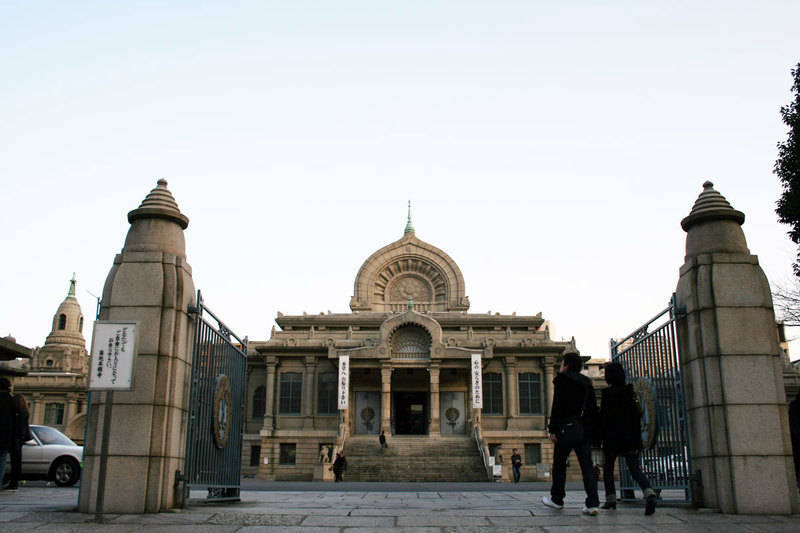 The architecture is strongly inspired by the Indian and South-East Asian Buddhist temples. Furthermore, above the entrance door there is another peculiarity: a tempered glass window typical of Christian churches. The interior is in Japanese style, except for the fact that there are chairs instead of the tatami floor. Inside there is also a large pipe organ, made by Walcker Orgelbau, and donated to this temple in 1970. Once a month, the last Friday of the month from 12:20 to 12:50, a free organ concert is held, which includes both Buddhist and classical music. An architectural complex with two towers, in Japanese known as Seiroka Towers. The highest reaches 221 meters in height, and is connected to the second tower via a suspension bridge on the 32nd floor. On the ground floor there are some shops and restaurants. The 47th floor of the north tower houses an elegant rooftop restaurant (Luke Restaurant with Sky lounge). Near the entrance to the restaurant you can enjoy the city view for free from some windows. The top floors of the south tower house the Ginza Creston Hotel. Should you choose to stay in Tsukiji? As long as there was the fish market, spending at least one night in Tsukiji was very useful to be able to see the tuna auctions early in the morning. Now that the market has been moved, there isn't any specific reason to stay in Tsukiji. However, it is a central area, close to the neighborhoods of Ginza (1 km) and Shimbashi (1 km) and well served by several metro stations. If you find a very cheap price, it might be a good choice. At the same price, there are better neighborhoods where to stay. The hotel we recommend the most is the Tokyu Stay Higashi-Ginza, located right in one of the outer market narrow streets. If you are traveling alone and you are looking for an accommodation that is both cheap and unique, along the way between Tsukiji and Ginza you can find the First Cabin Tsukiji, a sort of "luxury" capsule hotel with more spacious rooms starting at 4000 ¥ per night. If you want a room with a fantastic panoramic view on the top floors of a skyscraper, the aforementioned Ginza Creston Hotel on the top floors of the St.Luke's Garden Tower is one of the cheapest hotels in the city to offer a view from certain heights (all rooms are from the 30th floor up). A chain of sushi restaurants that are now everywhere in Tokyo and even in other cities. But their business started right in the narrow streets of Tsukiji, and there you can still find their first restaurant opened in 1990. Tsukiji is located on the banks of the Sumida river, facing the artificial island of Tsukishima and a short distance from the luxury district of Ginza. The nearest station to the Tsukiji outer market is Tsukijishijo station, served by the Oedo line (Toei Metro) providing an easy connection with Shinjuku. 800 meters away from the market there is Tsukiji station, served by the Hibiya line (Tokyo Metro) providing an easy connection with Roppongi, Akihabara, Ueno, Ginza. The nearest JR station is Yurakucho station, about 1 km and a half from the Tsukiji market.